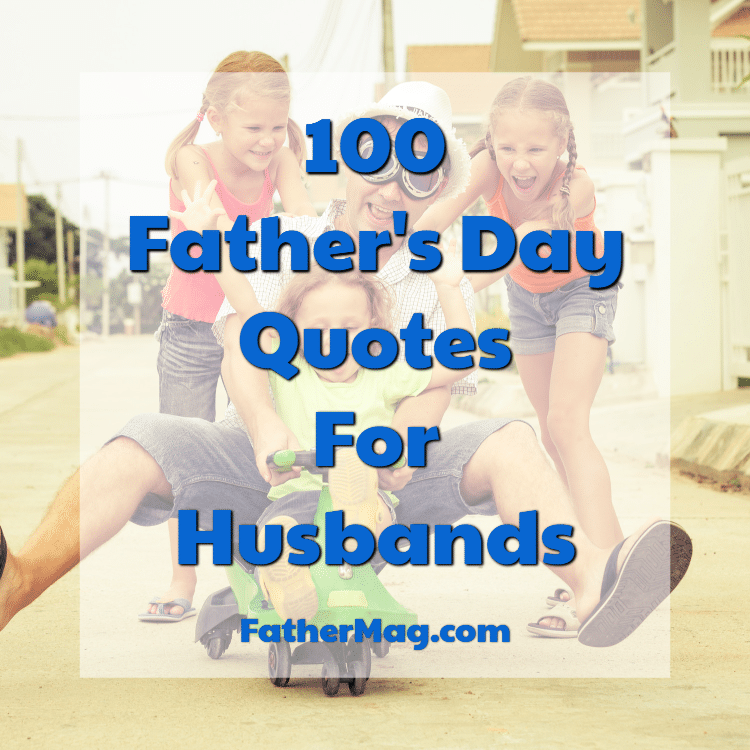 These father’s day quotes for husbands will help you express your gratefulness towards your husband and the things that he does for the family. Father’s day is a perfect time to thank him for helping you raise your kids and for providing everything they need. Make him feel special today and let him know how awesome he is and has been not just as a husband but also as a father to your children. 1. I loved you when I met you, now that you are the father of our children; I love you more than ever. Happy Father’s Day to the best dad and husband. 2. You are my rock, my sounding board, the love of my life, but most importantly you are the greatest father to our children. Happy Father’s Day, I love you. 3. You and I know how much you love to go fishing, so I thought this fishing card was the best way to remind you how much I love you! And yes before you ask, you can go fishing. 4. Life isn’t always easy, but there is no one that I would rather celebrate the good times with and whether the storms with. Happy Father’s Day. 5. The only thing better than having you by my side as my husband is having you as our children’s father. Happy Father’s Day, sweetheart. 6. You were there holding my hand on our first date, holding my hand during the birth of our babies, and now you continue to hold my hand through this beautiful thing we call life. I can’t imagine anyone else being there to hold my hand, Happy Father’s Day. 7. Keep calm, daddy’s home. Thank you for being the best you can be every day. Happy Father’s Day. 8. Wishing you the best Father’s Day filled with the things you love, so that you may cherish this special day in the years to come. 9. Being a good father can easily go unnoticed, yet it is one of the most valuable assets to a family. Here’s to celebrating you today and every other day of the year Happy Father’s Day. 10. Happy Father’s Day to the world’s greatest, father, husband, protector, and friend. 11. Thanks for loving me unconditionally even on the days when the house is a disaster, dishes fill the sink and the kids *plus mama* look like they have been playing at a zoo all day. Happy Father’s Day. 12. We hope you feel as special every other day of the year, as you do today. Happy Father’s Day to the best dad out there. We love you. 13. You fill the gaps to my weaknesses, I fill the gaps to your weaknesses, for that I am thankful. Without you, I wouldn’t have someone to open the jar lids that are too tight, without me you wouldn’t be able to find the milk. In the refrigerator. On the top shelf. Behind the pickles. Yes, the top shelf. Oh great, you found it. Happy Father’s Day, I will always be here to help you find the milk. 14. I still get butterflies when I see you interact with our children, thank you for being such an amazing father and husband. Happy Father’s Day. 15. Your love reflects in the eyes of our children. They beam with joy when you enter the room. I adore you and am so blessed to have a respectful, hardworking husband. Happy Father’s Day. 16. You are so full of compassion, love, and strength. When we need a strong hand of support in our family, you are always there. I love you for being who you are and for all that you do. Happy Father’s Day to a wonderful husband and father. 17. You always say that there’s a tool for everything. You’re right. The stud-finder worked miracles when it came to getting the perfect hubby. Happy Father’s Day. 18. Your love as a father shows through in your every interaction with our children. I’ve watched you and I can see that you love those children more than you could ever show them. You’re a fabulous father and I love you for being you. Happy Father’s Day to my amazing husband. 19. Happy Father’s Day to the man of my heart, the father of our children, the love of my life. I love our family and I love you. 20. The kindness you show to other people rubs off on them. They see you help others and give generously. You’re teaching them compassion and respect, manners and appreciation. We have so much to be happy about. I love our life, our family, and all that we have done, together. Happy Father’s Day. 21. The great love that I have for you is getting stronger, our angels are very happy because they have a father who loves them. Happy Father’s Day. 22. You’re so much more than just a “husband”. You’re a partner in my life that I value more than you know. You’re the father of my children whom I’ve watched love them so. You’re everything I hoped to help me raise a family. You’re my husband, my friend, the love that I’ll always need. Happy Father’s Day. 23. The effort you do every day for our family worth a lot, although you get tired always get to play with our children, truly you are my greatest treasure. Congratulations on this Father’s Day. 24. Life has given us a wonderful family, a happy home, and love for each other. Most importantly, it has given us each other. I am so grateful to have you as my husband. Happy Father’s Day. 25. We are a powerful duo. Together we have fun. We have become awesome parents and I’m so grateful that you’re my love. Happy Father’s Day to my husband. 26. You are their hero. They watch everything that you do, learn from everything that you do, and want to do everything that you do. You are and will continue to be, a big player in their self-esteem. You’re teaching them to be confident, self-assured, and proud. What in the world could I change about a man that loves his family, works hard, and treats his wife with love and respect? Absolutely nothing. Happy Father’s Day, Mr. Wonderful. 27. Let this Father’s Day can be very special to you, every day you make a great effort to bring up our family, I am happy to be your wife and the mother of your children. Congratulations, my life. 28. You give our children someone to admire, respect, and honor. You are a fantastic dad. 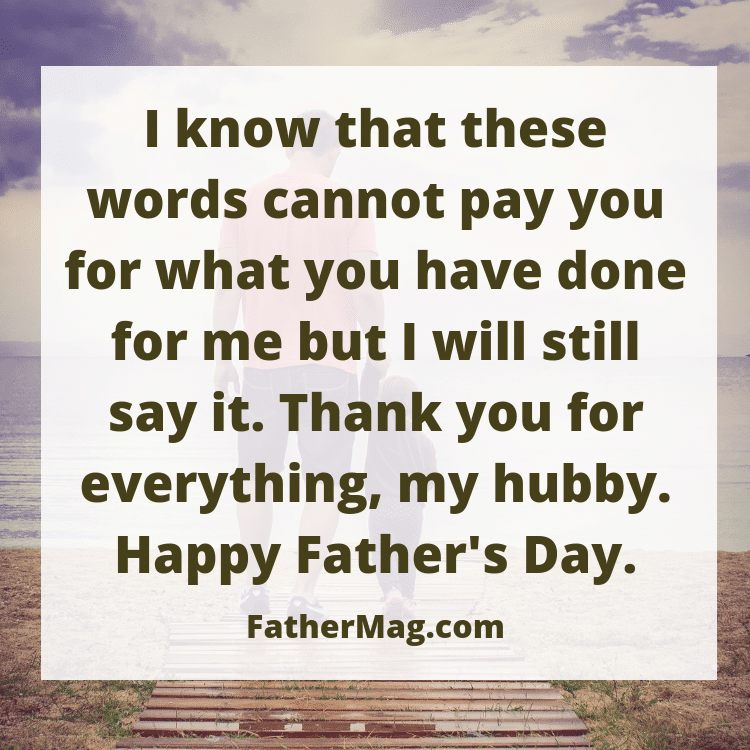 Happy Father’s Day to my loving husband. 29. Two things you should never forget. That Father’s Day is about you and that I totally love you, even more than I did before. Happy Father’s Day. 30. Our hearts are knit together in love. Our lives are built on that love, peace, and happiness. Our children are blessed because of that love. We must be doing something right. Happy Father’s Day to my husband, my love. 31. In those moments when I see you happy playing with our children I think about how lucky I am to have tired you and the angels that God sent to our home. You’re a great dad, the kids and I love you very much. Congratulations. 32. The place that you hold in my mind is as big as the place that you hold in my heart. I love you. Happy Father’s Day. 33. You are the hero of our children; they feel loved because they know that their father loves them. On this important day, I want to tell you to have a Happy Father’s Day. We wish you well. 34. You give our kids all the love in the world. They admire, respect, and honor you. You are the best father! Happy Father’s Day to my faithful husband. 35. Some people never know what it’s like to have a husband that’s also a friend. I do and I’m so grateful for that. Happy Father’s Day. 36. We’re a family and we’re totally cool. Happy Father’s Day. 37. Seeing what a great dad you only make me love you more. 38. I’m so grateful to be sharing life, love, and parenthood with a wonderful man like you. Happy Father’s Day. 39. The best thing having you as my Husband is our children having you as their daddy. 40. Happy Father’s Day to the man of my heart, the father of our children, the love of my life. 41. You have given our children someone to look up to and admire. You are such a fantastic father. I love you. Happy fathers’ day. 42. I admire you, I wake up each morning with a handsome man next to me the one I cherish, I also admire you for being a terrific father. 43. Two things you should never forget, that Father’s Day is about you and that I totally love you, even more than I did before. Happy Father’s Day. 44. The great love that I have for you is getting stronger, our angels are very happy because they have a father who loves them. Happy Father’s Day. 45. You make me happy. You make our children happy. You’re a great father, a great husband, and a great man. We all love you, dearly. Happy Father’s Day. 46. Life smiles at me every day since I’m by your side, we are blessed with very cute children who are happy to have their dad with them, congratulations on your day. 47. No one in this world can get our relationship and no one could understand me better than you. You are my everything. Thank you for giving me such a beautiful life. Happy Father’s Day. 48. My worries never really bothered me. They stay away from me while you hold my hand and embrace me. I am forever yours, my dear. I thank you for always being there for me. Happy Father’s Day. 49. I adore you with all my heart and that feeling will never go away; our kids are the proof of our love. Our family is the greatest treasure we have. Have a beautiful Father’s Day. 50. Girls always expect you excited for you to get back from work because they know you will give them so much love and play with them. You are a great father and a very tender husband. Have a great day, my love. 51. The effort you do every day for our family worth a lot, although you get tired always get to play with our children, truly you are my greatest treasure. Congratulations on this Father’s Day. 52. I could never thank you enough for what you have done for me all my life. I appreciate you. You are the best husband in the whole world. Happy Father’s Day. 53. I’m glad that we have both invested in our marriage, in our children, and in our life together. Dividends are great and selling shares are totally against the charter. Happy Father’s Day. 54. The place that you hold in my mind is as big as the place that you hold in my heart. I love you. Happy Father’s Day. 55. Your humor is a staple in our lives; how quiet our house would be without laughter. They expect tickles with your hugs and whiskers with your kisses. You’re teaching them to smile, to find joy, and to feel happiness. Thank you and Happy Father’s Day, my love. 56. Our daughter is a princess. And for her you are the king, I am filled with joy to be the queen in this beautiful fairy tale that is our home. Congratulations on your day. Happy Fathers Day to my husband. 57. I wish you a very happy day. Because you deserve it for being such a great dad for our children, and also a wonderful husband. I wish you the best. Happy Father’s Day. 58. Let this Father’s Day be very special to you, every day you make a great effort to bring up our family, I am happy to be your wife and the mother of your children. 59. We are a powerful duo. Together we have fun. We have become awesome parents and I’m so grateful that you’re my love. Happy Father’s Day to my husband. 61. I am blessed to have a loving husband like you. And more than that, to have a man who knows how to raise and takes care of his children so well. Happy Father’s Day to you. 62. You are so full of compassion, love, and strength. When we need a strong hand of support in our family, you are always there. I love you for being who you are and for all that you do. Happy Father’s Day to a wonderful husband and father. 63. When we get married I felt a great joy, but nothing compares to the joy that wakes me up every morning and finds you by my side, you’re a good husband and an excellent Father. Have a Happy Father’s Day, my love. 64. Every time you play with our children I feel a great happiness to be your wife, I love you with all my heart. Congratulations on this Father’s Day. 65. When we got married we decided to start a family and now we are the parents of two beautiful children, with each passing day I feel my love for you grows, you are a very dedicated Father and an amazing husband. Happy Father’s Day. 66. I adore you with all my heart and that feeling will never go away; our kids are the proof of our love. Our family is the greatest treasure we have. Have a beautiful Father’s Day. 67. You work hard every day, but always come home and spend time with our children. I admire you and feel a great joy to be your wife. The love you show for us is my source of happiness. Have a great Father’s Day. 68. Our children admire you and consider you as their hero. You play well your role as a parent and that’s something I treasure. On this special day, I want to tell you to have a great Father’s Day, you deserve all the happiness in the world for the great love that you give. 69. Our children say they want to be like you and that moves me to tears because you are a good man. I know that marrying you was the best decision of my life and I am happy because I know I will be never disappointed by you. Congratulations on this Father’s Day. 70. Have a beautiful Father’s day, my love, you and our children are the most precious of my life. I love you with all my heart, my dear husband. 71. Dear husband, I wish you a very happy day because you deserve it for being such a great Dad for our children and also a wonderful husband. I wish you the best. Happy Father’s day. 72. Let this day be special to you this year and for all years to come! I am happy to be your wife and mother to this little handsome boy who looks like you so much. 73. Looking at this tiny cute boy, I see you. What would I like to change in my life? Absolutely nothing, my love! Happy Father’s Day to you. 74. You are my hero. Happy First Father’s Day, Mr. Perfect. 75. Have you ever thought that having a baby is such a joy? Now our lives are knit together forever with these little hands that hold our hearts. Happy first Father’s Day. 76. Looking at our baby, I know that I am blessed. So you are. You make our lives filled with peace, love, and happiness. Happy Father’s Day, darling. 77. Now when we have a son, I love you more than a human being can ever do. Enjoy this holiday today and forever! Happy Father’s day, my love. 78. All my sentimental wishes for father’s day go to you on this day, my love. I cannot imagine my life without you and our baby. Happy Father’s Day, sweetie. 79. I know what happiness it because my father loved me so much. Now you give this love to our daughter and I feel that she is as blessed as I am. Thank you, my love, for being so kind and caring! Happy Father’s Day. 80. The only thing better than having you by my side as my husband is having you as our children’s father. Happy Father’s Day, sweetheart. 81. Let this Father’s Day can be very special to you, every day you make a great effort to bring up our family, I am happy to be your wife and the mother of your children. Congratulations, my life. 82. You have given our children someone to look up to and admire. You are such a fantastic father. I love you. Happy fathers’ day. 83. Two things you should never forget. That Father’s Day is about you and that I totally love you, even more than I did before. Happy Father’s Day. 84. You make me happy. You make our children happy. You’re a great father, a great husband, and a great man. We all love you, dearly. Happy Father’s Day. 85. Being a good father can easily go unnoticed, yet it is one of the most valuable assets to a family. Here’s to celebrating you today and every other day of the year Happy Father’s Day. 86. I am the luckiest person in the whole world because I have a loving and caring husband like you. You are the best. Thank you so much for always supporting me. Happy Father’s Day. 87. After you have entered in my life, all my problems and difficulties seem to have been disappeared. Thank you, baby, for making my life so special and full of joy. Happy Father’s Day. 88. When I first saw you, I have fallen in love with you. I am very lucky to be your wife. Thank you for accepting a flaw full women like me. You are the best thing that could ever happen to me. Happy Father’s Day. 89. Being your wife, I love even a single moment spent with you. You have filled this life with lots of love and happiness. Thank you, baby, for making my life wonderful. Happy Father’s Day. 90. I appreciate you being my husband. You are the best. Happy Father’s Day. 91. Your love is simply everything for me, it’s all I need. Thank you so much. Happy Father’s Day. 92. Without you, my life would have been extremely boring and nasty. Thank you for coming into my life. Happy Father’s Day. 93. I was able to bear all the burden of being a loving wife and a good mother only because you were with me and you have always given me the strength to hold on. Thank you for always being there for me. Happy Father’s Day. 94. You have never abandoned me even in the darkest hour. You have stayed strong and given me strength too. You are the best thing in my life. I am so lucky to have you as my husband. Thank you. Thank you so much for everything. Happy Father’s Day. 95. I know that these words cannot pay you for what you have done for me but I will still say it. Thank you for everything, my hubby. Happy Father’s Day. 96. There are three positive types of a husband. Good husband forgiving you past and accepting your present. The best husband who have the power to overlook your present mistakes and then comes the perfect husband who can forgive all sorts of mistakes you made. You are the perfect husband and I want to thank you for everything. Happy Father’s Day. 97. Without you, I would have been lost somewhere in the race of life. Thank you, dear. Happy Father’s Day. 98. You are my strength. Thank you for being by my side every time I needed you. Happy Father’s Day. 99. I always thank God for blessing me with such a loving and caring husband. I clearly do not deserve you and I thank you for giving me the honor of being your wife. Happy Father’s Day. 100. I feel most comfortable when you are near me. You are my hidden strength. I love you more than my life. Thank you for making my life so beautiful. Happy Father’s Day.